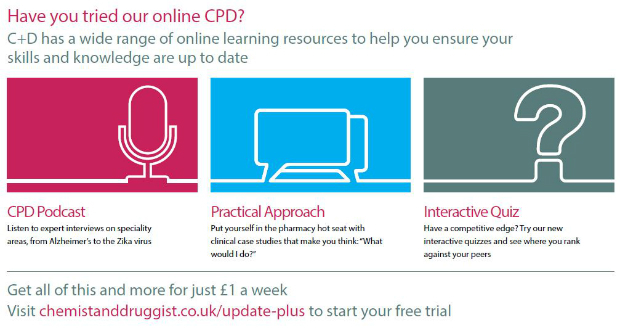 Community pharmacy is increasingly involved in schemes to help individuals with multiple chronic illnesses to manage their complex medicine regimes. Here, three pharmacists tell C+D how their specialist expertise made an impact on patients. I am involved in a year-long scheme – part of the Community Pharmacy Future project created in 2011 by the "big four" multiples – to support better outcomes for people with long-term conditions. For example, one of the work streams supports patients who are taking multiple medicines, including for cardiovascular disease and/or diabetes. Patients who met certain criteria were either referred through the GP or identified by the dispensing team, and were offered personal care plans. After an initial detailed appointment to pick up any problems, we set them health goals and then saw them every two months, with a more in-depth review after six and then 12 months. One patient we saw really stands out. She had hypertension which had not been reviewed for a long time. During her first appointment her cholesterol was through the roof, and her blood pressure was so high she needed to go to the hospital. Later, she mentioned some symptoms that were suggestive of diabetes, so we arranged a GP review. It turns out she did have a quite advanced [stage of the] disease. Her medicines were all changed to treat her resistant hypertension, diabetes, and high cholesterol, and we went through the British Heart Foundation cholesterol advice quite closely. As she was a smoker, we also started her on Champix and she successfully quit smoking, started exercising and eating more healthily. It’s a cliché, but professionally helping patients like her brings such great satisfaction. When we enrolled her she cancelled on us twice, but I persisted, and every time I see her she is so thankful that I did. She was a ticking time bomb before, and if it wasn’t for the service [her conditions] may not have been picked up before she had a heart attack or a stroke. But now she understands the value of her health and she has reduced her risk dramatically. I was doing a medicines use review (MUR) on one of my patients who had previously suffered a stroke and also had angina. He mentioned that he was going to the toilet a lot and feeling tired, so we did a diabetes check there and then. His blood glucose level was very high so we referred him straight to the GP. He had absolutely no clue he was at risk of diabetes, and afterwards he wrote me a note – which I still have – saying he could "not thank me enough" for picking it up and that he would take all his medication without fail. However, at a later point in time his wife phoned me, because he was becoming very forgetful and she wanted advice. I advised her that she knew him best, and to go see the doctor if she was concerned. [As a result] her husband has just been started on memantine for early dementia. He has just had another MUR here and we have been talking about how he is going to manage to remember to take his medicines, and what we can do to help prompt him. At the moment he is managing reasonably well, but we decided to give him the first two weeks of his medication, after which he will come back and we can check how it’s going. Doing an MUR reinforces the idea that a pharmacist is someone a patient can speak to about any medication or health concern. It does make it worthwhile when you can pick up on these issues. For two days a week I work at the Giltbrook Surgery, as part of the Newark and Sherwood clinical commissioning group’s GP/pharmacy transformation project. The programme is locally funded by NHS England North Midlands, and is designed to maximise patients’ health and wellbeing by making efficient use of the skills of both GPs and community pharmacists. I run clinics on the management of long-term conditions, and see patients who are on a number of medications, or who are struggling to control their condition. Each appointment is for 20 minutes, where I offer advice as well as a thorough medication review. I also advise people on things like side effects, dosing, allergies, interactions or formulation problems, as well as [conducting] home and care home visits. I visited a patient at home for a blood pressure check and a medication review, during which I discovered she had low vitamin D and low iron levels. Her medication quantities were all out of line, which was making ordering her medicines difficult. Her ankles had also swollen and she was complaining of having to urinate frequently – every hour during the night – despite already being on medication for this for six months. After a discussion with her GP, I ordered repeat blood tests, stopped her amlodipine (the cause of the swollen ankles), removed inappropriate medications from her repeat prescription list, sorted out her supply of medicines, and issued an alternative medication to manage her urinary frequency. Her daughter was very appreciative as they had been having so many problems ordering medicines, and of course the patient was even more grateful. We are still trying to solve her urinary frequency, but her vitamin D levels are back to normal, as is her swollen ankle. This project allows me to work autonomously and really get involved in patient care. I’m now expanding the services I offer and it’s very rewarding. The patient feedback has been 100% positive. How have you helped a patient with multiple conditions? Sahaja Yoga meditation can give you a great help with your health.It is free and practical and there are local weekly meetings in many places. "Silence Your Mind" is a Sahaja Yoga book written by Dr Ramesh Manocha,GP and researcher at the university of Sydney in Australia.It was published in 2014 and presents the medical case for Sahaja Yoga meditation clearly and conveniently.GPs and nurses and pharmacists would do well to read the book. "Silence Your Mind" was mentioned in a letter in The Nursing Standard in October 2014,in connection with an article on spiritual needs in patients. Suffering from schizophrenia myself I find that meditating using Sahaja Yoga techniques is invaluable,a lifeline.It does something beyond the realm of doctors and medicines.It is more like a spiritual breakthrough,like the psychiatrist Carl Jung spoke of in connection with the birth of collective consciousness.Dr Manocha cautions that mental health patients should meditate with appropriate supervision by mental health professionals. The teachings of the guru Shri Mataji Nirmala Devi and Sahaja Yoga meditation are the way forward surely and definitely should be considered for longterm healthcare. How can low vitamin D and iron levels be discovered from a blood pressure check and MUR? To clarify, my understanding is that Ms McMullen discovered the vitamin and iron levels at some point during her visit to the patient's home - not necessarily as a direct result of the blood pressure check or MUR.